Sri Lanka General Election 2010: Voting for the ‘Undiscovered Country’? Keeping an eye on his beloved island...? To melancholic Hamlet, death was an undiscovered country. In Shakespeare’s most famous soliloquy, the Prince of Denmark hesitates in his consideration of suicide not because of an absolute Christian belief in divine retribution, but because he is afraid of an afterlife of which he cannot be sure. For the more cheerful among us, the Future is the great Undiscovered Country. It’s a notion that has been used widely by science fiction writers, and in 1991, it was popularised by Star Trek VI: The Undiscovered Country is the sixth feature film in the Star Trek science fiction franchise. All this forms the backdrop (well, sort of!) to my latest op ed essay, just published by Groundviews citizen journalism website. Titled Voting for the ‘Undiscovered Country’?, and timed for Sri Lanka’s general election 2010, it takes a look at the most important common element discussed and debated during the election campaigns by all parties: Sri Lanka’s future prosperity. As I note: “Our endlessly bickering political parties rarely agree on anything, so it’s refreshing to see a broad consensus on what this election is fundamentally about: future prosperity. I go on to say: “How we wish Sir Arthur C Clarke was still with us at this crucial juncture in our history! For half a century up to his death in March 2008, the author, explorer and visionary was Sri Lanka’s amiable ‘tour guide’ to that ‘Undiscovered Country’ called the Future. The rest of the essay is a concise exploration of Sir Arthur Clarke’s advice offered to his adopted homeland over several decades, and covering different areas of public policy and public interest such as education, technology, environmental conservation and managing human diversity. Read the full essay on Groundviews, and join the online discussion. 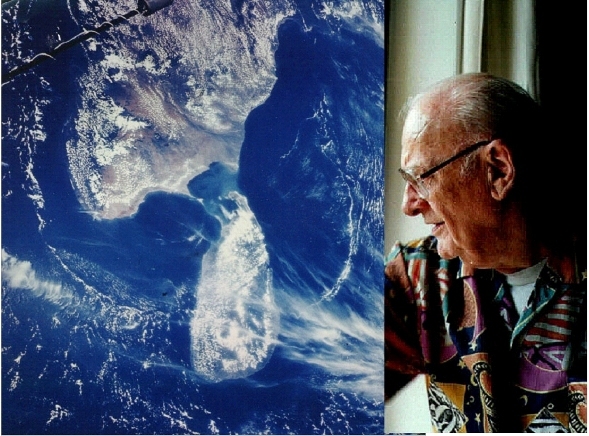 Note: This essay is partly based on the Arthur C Clarke memorial address I gave at the British Council Colombo on 17 March 2010.